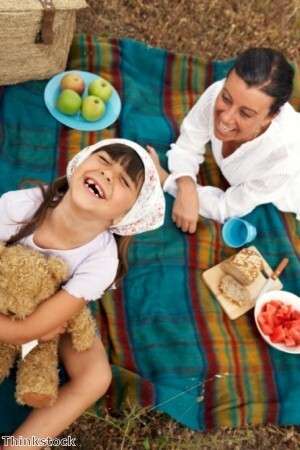 Enjoy Productive Picnics with the Kids in the Park - Mummy's Gone Mad! | Mummy's Gone Mad! Summer might not quite be here yet, but with the snow finally being replaced by clearer skies and warmer winds we’ve now got the chance to get outside without having to wrap up in countless layers of clothing. So in order to take full advantage of the opportunity to enjoy the sun’s warmth for the first time in months, what better way to banish those winter blues than by taking the kids for a picnic in the local park? The beautiful landscaped grounds are not only the perfect place to relax and give our youngsters a chance to run around, but it’s also a fantastic location for introducing little ones to the environment. What’s more, with a picnic being the focus of the day, it can be a brilliant way to get them acquainted with foods that they may be less inclined to experiment with at the dinner table. By teaching kids about nature and finding ways to expand their diets we can have an extremely positive impact on their sensory development – and the best thing is that this can be done in a fun environment with no pressure if you’re in the confines of a fantastic natural setting. Here we’ll take a look at what the park has to offer and why it’s the ideal place to head out for an afternoon picnic with the children. Getting our kids acquainted with nature is a good tactic for teaching them to appreciate the world around them, and heading to a park full of life is the perfect way to do this. Not only will any ponds or water gardens expose them to colourful plants and blossoms, but information on ducks, geese, squirrals and birds can be taken along for brief spot of animal watching as well. Parks provide a brilliant, hands on, educational and entertaining setting that can be a great change from built up city areas where everything seems to move at a hundred miles per hour; so how will you make the most of your day? It’s no secret that kids have bundles of energy that it can take hours to burn off, and channelling this into fun, productive exercises is one of the most effective ways to take full advantage of their vigour. By taking their favourite educational toys along for the day out, it’s possible for our youngsters to get closer to nature while at the same time sharpening their minds. These resources can be a vital asset in ensuring out little ones take part in plenty of sensory activities, which is especially important to help them develop the appropriate coordination, logic and knowledge to develop. Exposing little ones to as wide a variety of food as possible from a young age can be an effective way of promoting healthy eating habits as they get older – and getting them to help set up the picnic is one of the best methods for making them feel involved. Play food and toy dinner sets can work brilliantly in this setting, and there are plenty of other brilliant gift ideas for kids that will make their time at the park even more enjoyable. So if you’re stuck for ideas on easy ways to keep the little ones entertained this summer, head to the park with a picnic for a fun-filled afternoon.